A little while back the Vegas Golden Knights did a very smart thing by signing Reid Duke as the first player in their franchise. It was smart not because Reid Duke is some glorious can’t miss prospect. but it was smart because Reid Duke is a very strong player who has excelled in junior and is worth taking a look at in the AHL next season. Since the current Vegas AHL team roster consists of just Reid Duke, maybe it’s time to look at another player who has excelled at junior and could thrive in the AHL, and that player is Tyler Wong. While a 100 point season from an overager isn’t out of the norm (3rd in the league in scoring), this is the second year that Wong has been above a point per game, and he put together a solid draft year with 56 points in 64 games, numbers that easily get you drafted if you’re not 5’9. 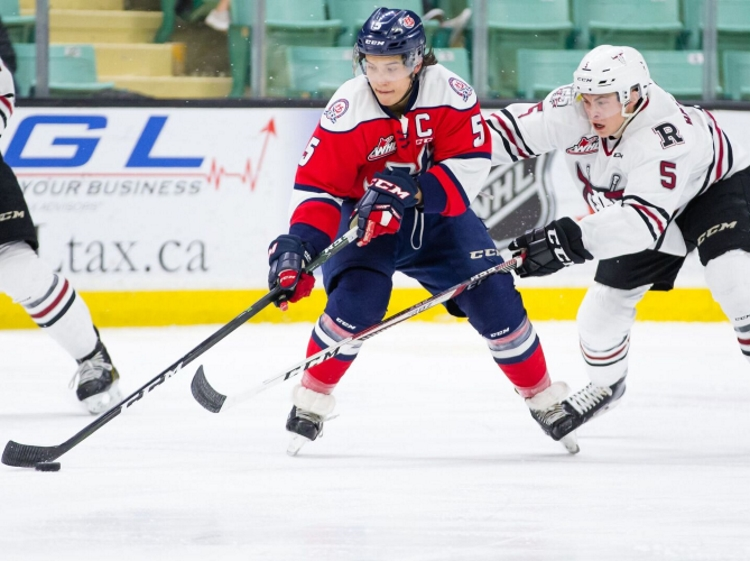 Wong’s 24 points in 20 playoff games should also show his value, as he was the key player in pushing the juggernaut Regina Pats to six games in the conference final. Looking at Wong’s numbers in more detail (via Prospect-Stats.com) you can see that Wong was second only to Adam Brooks in even strength goals + 1st assists, was in the top 10 for estimated time on ice, and had an impressive goals for % of 59.59. Wong did however benefit from quality linemates, as he played 64% of the time with Giorgio Estephan, another criminally underrated prospect, and solid center for Wong. A stingy, competitive two-way forward that has the skill to consistently create offence and the defensive awareness to limit the opposition’s time and space. Excellent vision and creativity. Strong on the puck and quick to get on the backcheck. Very active defensively and doesn’t give up his own end to dominate offensively. Many smaller players play on the perimiter, but Wong isn’t afraid of going to the hard areas and battling for possession. A true all-around player with the drive to compete and win. Wong seemingly checks all the boxes for what teams should be interested in, with the exception of size. He may be a long shot for the NHL, he might even be a borderline AHLer at first, but no team is in a better place to find out than the Vegas Golden Knights. When you consider that Vegas will immediately add 30 players in the expansion draft, some which may be free agents they can’t or won’t sign, and the rest of free agency will be about attracting players to a team that has seemingly no chance of winning in year one, they are going to struggle to get to a respectable 40 standard player contracts. And through the expansion draft it seems likely that the Knights will have a fair shot at NHL defensemen and goaltenders, but talented goal scorers and offense producers will be in short supply. Wong gives them a lottery ticket for the future. A junior scorer who can likely fill other roles as well, and help build a prospect pool in what is a relatively weak draft year. By sliding to 6th in the entry draft it has become even more of a challenge to find offense, grab the low hanging fruit. As much as this is making a case for stocking a completely empty cupboard, Wong is a player that is worth bringing for more than just icing a full AHL roster. A lot of characteristics are quite similar to Connor Brown on the Leafs. He’s continued push himself further than anyone expected him to go. He doesn’t have the size, but he’s not a player that backs down. He’s proven that he can be on the ice in any situation and make his team better, and unlike Brown, Wong has a bit more speed to his game, which will likely make him a more capable creator of offense. I know Lethbridge was just eliminated, but I honestly can’t believe the kid hasn’t been signed yet, by Vegas or anyone else.